MADISON – More than 10 million acres burned across the country during the 2017 U.S. wildfire season at a cost of more than $2 billion — the largest bill ever. "We've seen that many wildfires are caused by people living in close proximity to forests and wildlands. And that when these fires are spreading, they are much harder to fight when people are living there, because lives are at risk, because properties have to be protected," says Radeloff, who wanted to use the current study to understand how that risk developed over time. 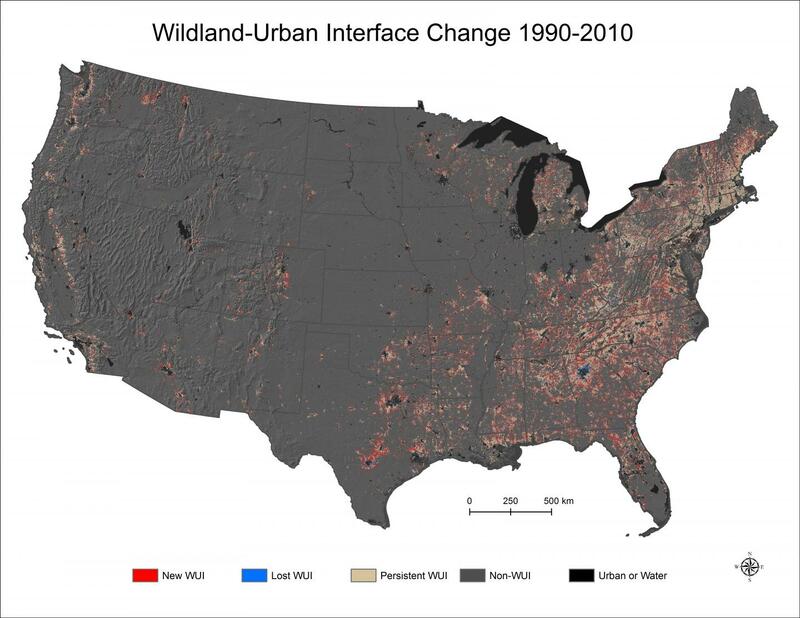 Overlaying information from the USGS' National Land Cover Database on modified Census data, Radeloff's group tracked the change in the WUI over the 20-year study period. They found that 9.5 percent, or 190 million acres, of the continental United States fell into the WUI in 2010, up from 7.2 percent 20 years prior. The number of houses within the WUI increased from 31 million to more than 43 million in the same time period. "So there's a lot that can be done. And I think what our data shows on the development side, and others have shown on the climate change side, we better start doing it or otherwise we will have news like what we had last fall again and again," says Radaloff, referencing the devastating wild fires that swept through densely populated regions of northern California. Admitting that it might seem counterintuitive, Radeloff says he is glad that people want to live where development meets wild lands. "I think it reflects that people love nature. That's a very good thing. They're making the biggest economic decision of their life and it reflects an affinity to be close to wild places," he says. "That is great — it's just that when millions of people do it at the same time that the effects are what I don't think anyone wants to see. And dealing with that is what I hope our work will help do." This work was funded in part by the U.S. Forest Service Northern Research Station, the interagency Joint Fire Sciences program, the Land Change Science Program in the US Geological Survey Climate and Land Use Mission Area, the Fulbright Exchange program and the Foundation for Science and Technology of Portugal.